이 석비는 조선왕조 제16대 임금 인조(仁祖, 1623~1649)가 반정(反正)으로 왕위에 오르기 전에 머물렀던 별서(別墅)를 기념하고자 숙종 21년(1695)에 세운 것으로 인조반정에 관련된 중요한 역사적 사실과 그 현장을 증명해 주는 사료로써 가치가 있다. 표제는 조선 19대 숙종(肅宗)의 어필(御筆)로 ｢인조대왕용잠지시별서유기비(仁祖大王龍潛之時別墅遺基碑)｣라고 쓰고 뒷면 음기(陰記)는 숙종의 어제(御製)를 동평군(東平君) 이항(李杭)이 쓰고 있어 가치를 더해준다. 석비의 조형적 측면에서도 거북받침돌은 중국의 영향을 받아 새롭게 등장한 조선시대 초기양식의 전통을 잇고 있는 동시에 지붕돌은 이수 대신 간결한 한옥양식으로 변화된 후기 석비양식의 특징을 완벽하게 보여주고 있어 조선시대 석비예술의 흐름을 파악하는 데도 귀중한 자료가 되고 있다. This stele was erected to commemorate the private residence where Injo, the 16th king of the Joseon Dynasty (1623-1649), stayed just before he was crowned king subsequent to the dethronement of his predecessor. 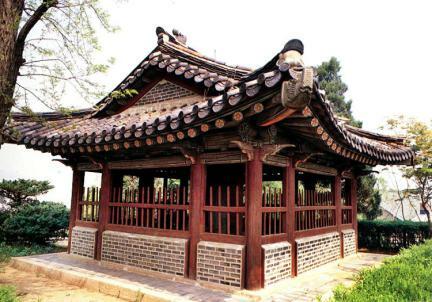 It was built in 1695 (the 21st year of the reign of King Sukjong), and is of great historical value as it provides historical evidence of and valuable information about the Injobanjeong (the coup d’état of 1623). The inscription on the front of the stele was written by Sukjong, the 19th king of the Joseon Dynasty, and reads “Stele commemorating King Injo’s stay at this private residence immediately prior to his enthronement.” The inscription on the back is the same as that by King Sukjong, but it was written by Prince Dongpyeong Yi Hang. 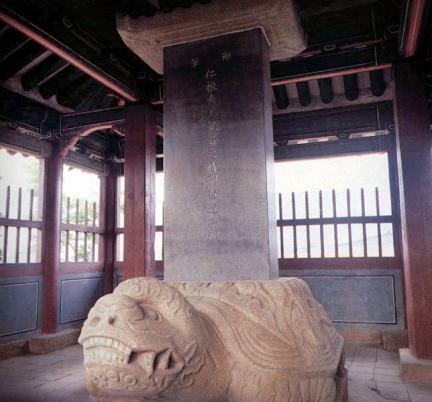 The stele’s tortoise-shaped pedestal is characteristic of the style that emerged in the early Joseon Dynasty under the influence of China. However, the top part of the stele exhibits the simple style of a traditional Korean roof rather than the ornamental capstone, evidencing the change in style of stone monuments of the late Joseon Dynasty. In this respect, this stele is a valuable material for understanding the trends in sculptural styles of stone monuments during the Joseon Dynasty.